Zieleniec Ski Arena is the capital of alpine skiing in the Kłodzko region. This is mainly due to 23 kilometres of beautifully situated and picturesque ski slopes, varying in length and, in particular, in the level of proficiency. The more demanding skiers and snowboarders will love it – the longest trail in Zieleniec is 2800 meters long; there is also a black trail called “Na krechę” (Straight down the slope), but also families who want to try skiing, or just spend their free time in a nice and active way in the open air will find something for themselves. 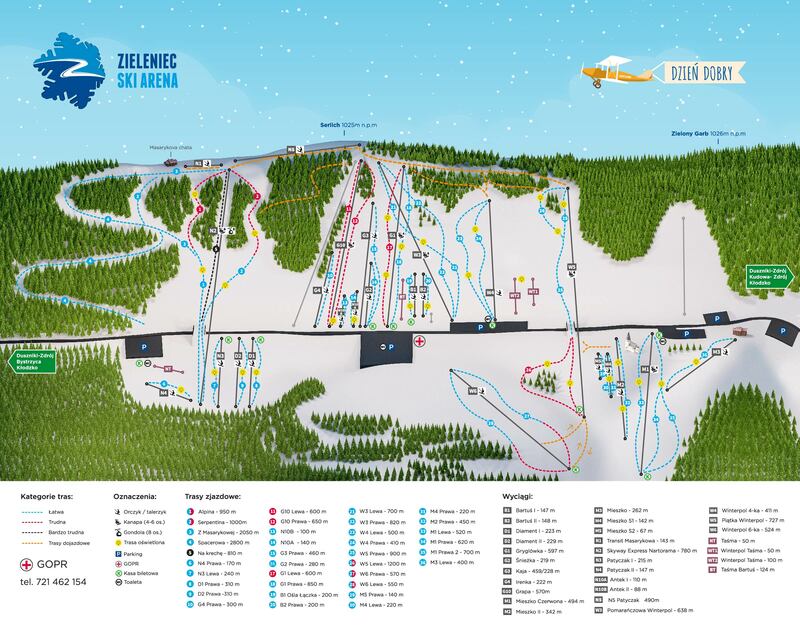 It is also worth mentioning that most of the ski trails in Zieleniec Ski Arena (22 trails to be precise!) have artificial lighting, so that you can ski on our slopes until 21:00.